dessert girl: Would You Like Some Bread with Your Sprinkles? 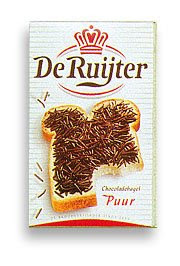 A coworker of mine, who was born in the Netherlands, told me that she puts these chocolate sprinkles on bread and claims that it's a really great treat. To which I replied: Sprinkles on bread? Okay, if you say so. Wanna try them for yourself? You know you do! Visit The Little Dutch Girl for more info. I don't know...anything with chocolate on it has to be good. It would be worth a try.